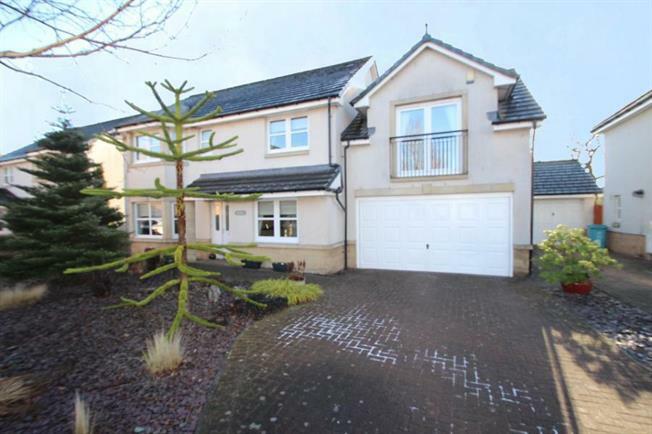 5 Bedroom Detached House For Sale in Coatbridge for Offers Over £270,000. Set amid landscaped gardens is this impressive modern detached villa with double garage. Forming part of Bellway Homes Orchid Grove Estate , The Morar provides versatile and flexible accommodation formed over two levels. The ground floor extends to entrance hallway ,bay windowed lounge, separate dining room with doors leading to gardens, additional family room/study, a modern kitchen with integrated appliances and downstairs cloaks/wc. On the first floor the master bedroom has a Juliet balcony , en-suite showerroom and dressing room. There are four other bedrooms, bedroom two having an en-suite showerroom, and additional house bathroom.The property features gas central heating, double glazing and has a driveway leading to an integral double garage. There are landscaped gardens to the front and private enclosed south gardens with lawn area. Coatbridge has a good selection of shops, including The Faraday Retail Park, and schools at primary and secondary level. The Carnbroe area is ideally placed to give quick and easy access to the M8 motorway for commuting to either Glasgow or Edinburgh.